Beautiful gifts for a friend’s wedding or your own anniversary. These one of a kind pottery items commemorate their celebration of life and love! Whether it’s a house warming gift for a friend, or remembering the old homestead, this is a perfect gift to preserve the memories! Looking for a unique gift to celebrate a birth, and all the years after? 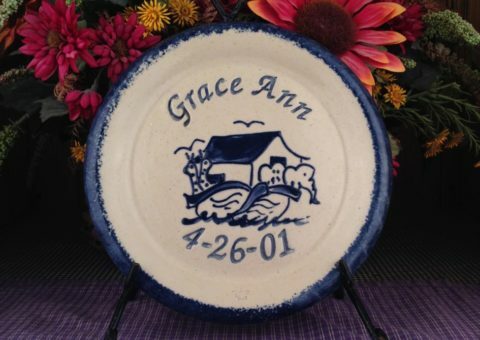 These handmade perFFsonalized pottery items are certain to become ‘passed down’ keepsakes! Looking For a Unique Pottery Fundraiser? 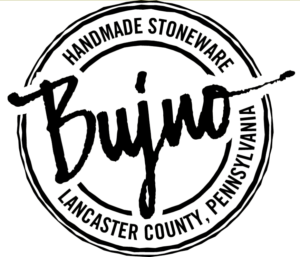 Bujno Pottery also makes custom pottery for fundraising and commemorations! 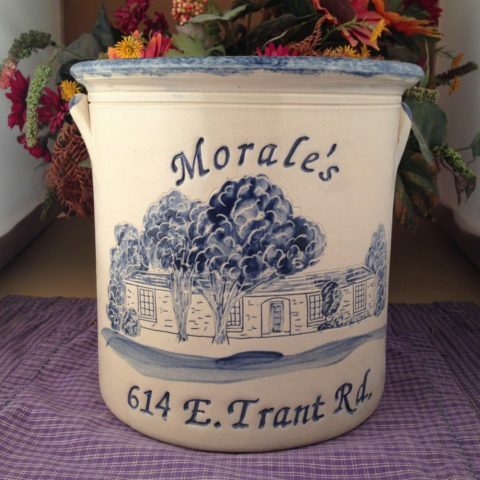 Whether it’s for your local church, library, women’s organization, civic or historical society, we can take your line drawing and text to create a one-of-a-kind stoneware pottery piece. There are no minimums!! For more information, follow this link to the Bujno Pottery Fundraising and Commemorative section of this website. Dear Tina, The cat bowls arrived today and are so beautiful, just perfect! Thank you so much to speed up the order. Jonesy is visiting and he can enjoy them before he goes home. His “Mom and Dad” will be so delighted as he is their “Child”. I have no grandchildren, but you should her me brag about my Grandcat! Thank you again! I just received my new crock I LOVE IT !!! I knew I would because I love all of the ones I have. I just wanted to thank you and your crew for a wonderful job…thanks again. Hi Tina, I received the crock today. It’s perfect. Thanks for your superb service. Much appreciated. Thank you! Beautiful, just like all of your work! hundreds! Thank you so much! Pleasure doing business with Bujno! for the beautiful piece to add to his new kitchen! and we will. Nice Job!!!!! such quick and beautiful work. I hope to do business with you again!! the Lord bless you as you bless others. My sister received her gift today!!! She loved it!!! It turned out beautiful!! Thank you so much!!! Our pottery order arrived today. It is all great! 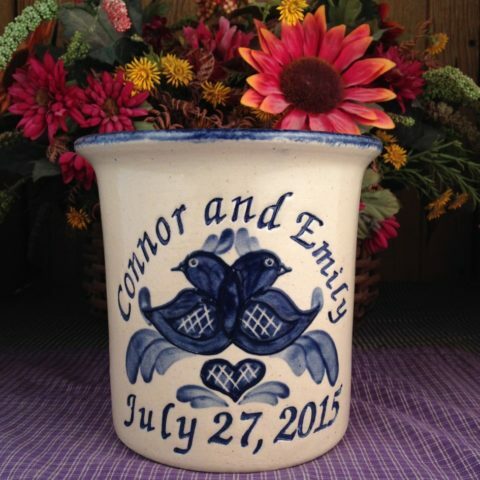 We are especially thrilled with the custom crock with our son's wedding venue on it. He and his wife are going to love it. I will be sure to thank you on Facebook after we have given it to them. Our son is the first of our seven children to get married, and we are from a large family, so you can count on a lot of future business from us. Thanks so much!